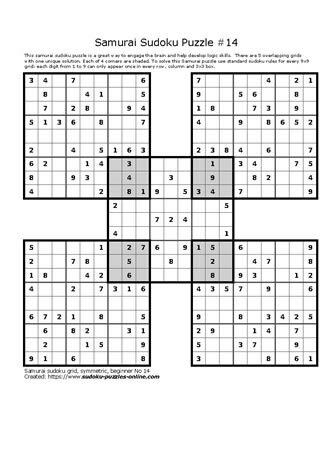 Give your brain a great workout by solving for the unique solution in this Samurai Sudoku puzzle. Use logic and basic Sudoku rules to solve this puzzle. Remember that the shaded areas are common areas between two puzzles, and the rules still apply. Enjoy the brain workout with a friend! Download, print and solve.